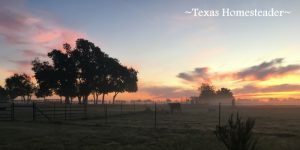 When RancherMan & I moved to our NE Texas ranch we outfitted our home to suit our new lifestyle. We were now empty nesters so our needs only included one guest bedroom for the occasional overnight guest. But we were basing our probability of overnight guests on the number of overnight guests we typically entertained when we lived in the city. Back then there were only sporadic overnight visits during the holidays and maybe an occasional weekend. For the most part our family lives very close to each other. Although we get together often it’s seldom necessary to spend the night. So we outfitted our new guest bedroom with comfortable yet meager offerings. We had a nightstand & desk, chest of drawers and an over-stuffed queen size folding futon. Our thought was that we could use that room when our grandbabies come to visit. They could all pile on the futon & watch cartoons together, etc. But what we didn’t include in the equation was the probability that folks would want to come & stay BECAUSE of where we now lived . It’s paradise for us, and it’s a relaxing country weekend for our guests. We still kept that futon in the guest room for a while. But we decided if we’re going to have overnight company this often they deserved a great night’s sleep! So we moved the futon to the office to accommodate overflow sleeping. We bought a nice pillow-top queen mattress & frame for the guest room, but we were stumped on the headboard. Now I realize headboards aren’t that expensive but I hate that they’re often very cheaply made these days. Plus I like to buy used whenever possible for environmental reasons. I told RancherMan that I’d rather get an antique headboard instead of buying new, maybe iron or even wood. But queen beds weren’t as popular back in the good ole days as they are now. Finding a queen-sized antique headboard proved to be a challenge. Perhaps we should consider a pre-owned headboard. And maybe we could paint it if it was wood. But even after searching for quite a while nothing really spoke to us. Then one day RancherMan casually mentioned that we could probably make a headboard out of some of the old wood planks we had removed from our 1880’s barn years ago when the exterior was refurbished. I was so excited because I was thinking the same thing! We picked out some really cool weathered 12″ wide boards that had been stored in our barn for several years. Heck prior to that they were on the exterior of our barn for probably 40 – 50 years (or LONGER). Only time can weather wood this beautifully! And since it came from our old barn it’s pretty sentimental to me. We pulled a rusted hinge from the boards but set aside the square nails that had held it in place. We toyed with the board layout and decided we wanted them horizontal so we measured and cut them to length. I really wanted the headboard to be two planks high and wanted to have a very small 1/2″ gap between them. We attached both boards to a couple of support boards that would ultimately be bolted to the bed frame. Then we stood back to take a look at our handiwork. Hummm… It’s missing something. I took those square nails we had removed from the wood before we started and RancherMan cut them down short enough where I could tap them into some existing old rounded-out holes and still have the heads visible. We placed them back into the headboard leaving them pulled out just a little to accent the square head and shaft of the nail. Yeah, yeah, I like it. Still not quite there though. Hummmm… I know, how would it look if we burned our brand into the corner! 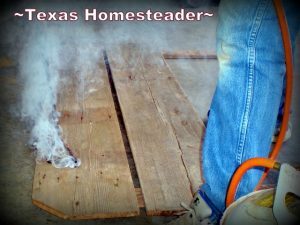 RancherMan fetched our brand and heated it with a propane brush torch until it was very hot. 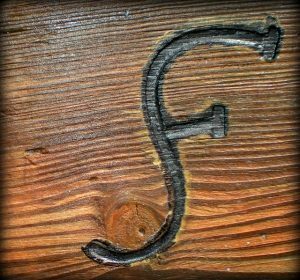 When he placed that super-heated brand onto the wood it transferred the image to the wood beautifully. Perfect – I LIKE IT! As a side note: Our brand stands for Sunrises Forever, it’s our mantra for the way we try to live our lives. We try to remember that no matter what happened yesterday, or last week, or even last year – every sunrise offers a brand new start, a blank canvas, a new beginning. It’s a wise man indeed that takes this opportunity to do something GREAT today! That’s the reason for the sunrise design in our gate and on our logo. Now we set the headboard up in our guest room & attached it to the frame with a couple of washers & bolts. But since our new (old?) headboard is made of some pretty rough wood we were concerned about it scratching the wall, plus the bolts might gouge the sheetrock. We thought about putting some felt on the boards closest to the wall but what about those bolts? We ended up using a couple of corks as spacers between the headboard and the wall. It was easy, we cut the corks in half longways and secured them to the back of the headboard with small trim brads. Love Our New (Old) Headboard! I think that our headboard turned out pretty cool. I figure if you’re going to have a piece of furniture in your home it might as well be something very meaningful & sentimental to you! And although cost was not the reason we worked on this fun project, it only cost us the price of the tiny brad nails we used to hold the cork wall buffers in place. Beautiful/Sentimental/Environmental/Inexpensive. Wow that’s quite a bit of benefit from one project! 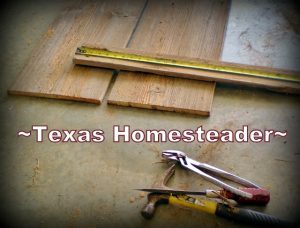 This entry was posted in Blog Posts and tagged Barn, Frugality, Make-It-Yourself, Ranch Life, Small Town Living on July 6, 2014 by Texas Homesteader. That’s a beautiful idea! We don’t have a headboard, but that’s something I’d like to get back to once our #yearofno is completed. Making one ourselves is definitely on my short list of ideas. That or reclaiming something. I like the rustic look, too. Very Pretty!! Thanks for sharing on My 2 Favorite Things on Thursday – Link Party!! Hope to see you again tomorrow!! Pinned! Your ‘new’ headboard turned out perfect. The brand set it off, totally! Love your brand btw! We have 2 guest bedrooms now that we are empty nesters. The Grandchildren prefer to sleep on the sofa rather than the beds though, must be a kids thing! Thanks for sharing at Merry Monday. I always enjoy your posts. Someone is handy with wood. Nice project. I especially liked the branding, nice touch. This is so cute and rustic. I have a friend who would absolutely love this! Pingback: The Lady Prefers 2 Save | Welcome to Merry Monday Linky Party #12! That’s so cool with the brand! Definitely a one of a kind piece. Thanks for sharing this on Merry Monday. Absolutely love it! All of it, the head board, the brand, the meaning if the brand, the paisley pillow cases, the quilt. It is no wonder folks want o spend the night. Thanx for sharing. OMG. 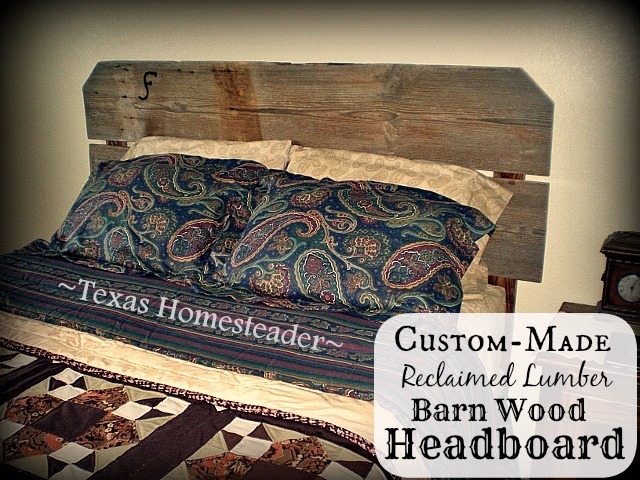 I totally love the rustic look of your headboard and very fitting for the country charm ranch. It really turned out great and love how you put your own ranch brand; giving it that very personal touch to it. Sunrises Forever…..luv that. That was wonderful that you had saved all the old barn wood. Yes, wouldn’t mind having my coffee served to me in a bed like that. You and RancherMan done an excellent job. Enjoy your evening and keep cool.